Crumpets provide's the best 24/7 holiday care for your pet, But don't just take our word for it, visit our website and have a look at our many Guest Book reviews. Crumpets is run from our home so we are always here ensuring everyone is happy and well. Nikki is a Veterinary Nurse. She has been nursing since 1997 and is extremely experienced with rabbits, guinea pigs, pygmy hedgehogs and small animal care. Nikki also holds a national diploma in animal care and pet store management, she continues to advance her knowledge and qualifications in this area and completed an advanced course for the nursing and care of rabbits. Giving a very high standard of care for your pet either in their own home or boarding at Crumpets. Nikki is very friendly, passionate, has years of experience and runs Crumpets with the same passion that you have for your pet. She goes the extra mile to ensure they settle in well and have a great time whilst on their holiday. Recommended by Vets and fully insured. We can offer house visits in the local area for pets such as cats who may prefer to stay at home. Visit our website for further details on this service. Unlike some boarders, Crumpets is not run around a day job, we care for your pet 24/7, keeping a close eye on them and ensuring they are enjoying their stay, anyone can set up as a small animal boarder with little knowledge or experience but when you leave your pet at Crumpets you leave them in safe, experienced and qualified hands. Our lovely large, spacious indoor rabbit hutches start from 10ft (3 meters) in size and are housed within a purpose built lodge kept to indoor conditions. Keeping them safe, secure and warm during the colder months (heated to around 18'c) and air conditioned during the hot summer months. We also have large purpose built indoor playrooms (@38sqft of floor space) for rabbits and guinea pigs which suit the guests who are not used to being housed within a cage. We have a large outdoor hutch and great outdoor runs for those sunny summer days. We offer lots of space in a safe, stress free, stimulating and fun environment. All our guests receive one to one care and attention and time outside their hutch every day. We have different set ups to suit every type of rabbit, guinea pig, hedgehog, hamster, gerbil or rat. We also offer all-inclusive boarding for birds such as budgies, canaries, cockatiels, lovebirds and parakeets. We provide spacious bird cages with all toys, perches, bowls, food and treats included. All our bird guests have time outside their cage each day to exercise their wings. We will not accommodate any species of animal that would be a natural predator to Rabbits, Guinea Pigs etc such as ferrets as this is unfair and stressful for our other guests. We dedicate our boarding facility to Small Animals only. Check out our website for further details, our link is at the top of the page. Each indoor hutch has its own allocated outdoor run. Each run has shelters/ tunnels and toys for a stimulating environment. When the weather is too harsh guests have access to an indoor run. We spend lots of one to one quality time with our boarders, making sure they are settled, stress free and happy. As Nikki is a veterinary nurse your pets are in safe hands and she can administer your pets medication should you require it. We have access to Veterinary Services 24/7. Crumpets can provide intensive nursing care and medical boarding. All rabbits must be vaccinated against RHD Strain 1, Myxomatosis (every 12 months) and RHD Strain 2 (every 6 months). Starting from £6.00 per day, Please check out our website for more details! Daily pictures and videos displayed on our Facebook page. Hazel Lodge - purpose built indoor playrooms for the guests who don't like to be housed in a hutch. We offer an all-inclusive stay, all you need provide is the guests we provide everything else including your pets normal pellets. Interactive care in a safe environment. Relaxing rats. Enjoying his honey stick, all treats, bedding and food are provided. Fresh veg is given daily. All treats, food, bedding are provided. A real holiday for your pets as our feedback shows, they have a great time! Large 10ft Indoor Hutches Orchard Rise and Apple Wood lovely large 10ft (3 meter) indoor rabbit hutches. Meadow Croft one of our 5ft Guinea Pig hutches. Orchard Rise 10ft Indoor Hutch Safe, secure and fun! The Brambles - our rat/ chinchilla/ Degu cage. Bruce enjoying his garden herbs. All you need to provide us with is the guest we do everything else! Lavender Lodge - Heated for the Winter, Air Conditioned during the Summer We offer a stimulating environment to ensure our guests don't get bored. Each guest gets one to one time every day. Tunnel tastic! Sammys Place - a large hamster cage suitable for Syrians. Edible carpet. Willow Warren our outdoor hutch. This hutch has a heater within it to prevent the sleeping area from dropping below freezing in the cold months. Willow Warren/ Outdoor. Venture - one of our all inclusive bird cages. Find us on Facebook for more photos and videos! Night Vision CCTv allows us to keep a close eye on our guests - ever wondered what they do at night? My two male guinea pigs had a great time at Crumpets over the Christmas holidays. They stayed in a large hutch and tried lots of new foods as well as their regular favourites. I received regular updates about their well being and they seemed very content when I picked them up. You can tell Nikki truly cares about all her small guests and is happy to help with any issue that might worry you. I can highly recommend Crumpets. Crumpets is a really wonderful place and Nikki is truly outstanding - a thoroughly amazing person - kind, caring, capable, thoughtful and extremely knowledgeable. She took such good care of our poorly guinea pig and nursed her back to health. We can never thank her enough for her kindness and wisdom. We cannot recommend her highly enough! She is worthy of a hundred stars not just 5! Bertie and Gail had a fantastic holiday at Crumpets. Nikki is incredibly bunny-savvy, and created a really personal experience to make sure they settled in well (including their favourite veg and lots of cardboard toys to keep them occupied). She totally understands how stressful it can be to leave your furbabies, and did a great job of putting my mind at rest. Thanks Nikki! I have already posted this as a google review but I wanted to share my review here as well: I have boarded my guinea pigs at Crumpets twice now (with another stay coming up) and I would not hesitate to recommend Nikki's excellent service to anyone looking to board their smallies. My guinea pigs were given excellent care and seemed very happy and relaxed when I went to collect them. Nikki also took care of a poorly pig for me and she was absolutely wonderful, going above and beyond in looking after my little one and giving me regular updates on her condition. I could not have asked for more! I am so grateful to have found Crumpets and I know I can trust Nikki to take the best care of my babies while I'm away! Nikki, if you're reading this - you are wonderful and I'm so glad I found you! Our beautiful bunny daughter Lils has just returned from her first holiday at Crumpets. We have put off going on holiday and leaving her somewhere as she suffers from gut stasis when moved or when we leave her with friends to look after. But after a year we thought we should bite the bullet and had Crumpets recommended to us through our vet. Even though there were other boarding facilities nearer to us we wanted only the very best and where we could feel confident she was in the best hands so booked her in to Crumpets. Before her stay I was impressed with the amount of information they required to get to know Lil and her "quirks" so that they were fully prepared for her stay there. I felt like she was in such safe hands especially as Nikki had been a Vet herself before. Throughout her stay she kept in touch every day with updates as to how she was doing and I felt so reassured and confident that she was in the best place and having a fun holiday of her own. Going on holiday has never been the same since having bunnies as I have never fully relaxed always worrying about them. But this experience has taught me that there is no need to live in fear as Nikki made it home from home for her, if not better! I am sure she was almost disappointed when I picked her up to take her home! I would have no qualms in booking a holiday again now and I am sure Lils can't wait for her next stay in her holiday home. Well worth the journey there, and well worth the reasonable cost- you just can't put a price on peace of mind! Especially with a risky bunny like her. I cannot recommend Nikki and Crumpets enough! We highly recommend Crumpets as Nikki looks after all the animals with love and much attention. She has helped us with our diva rabbit Cocoa so much. She is always a calm rabbit when she comes home. It was my first time using Crumpet's and having had a few bad experiences with previous bunny boarding facilities I was a tad nervous, but from the very first communication it was flawless. We were provided with lots of information before the buns boarded, everything was thought of and noted and when we dropped them off the facilities were wonderful. 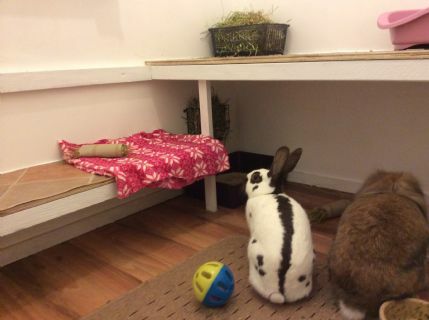 Everything was ready for their arrival and Nikki was sure to make sure they were settled in their new hutch in their own time. She gave us an email update the next day of their stay so we knew they'd settled and were eating, drinking and using the toilet, which allowed us to relax and enjoy our holiday safe in the knowledge the buns were doing good. We had regular updates and Nikki uploaded a video to facebook during their stay so we could see they were doing well! I've never felt comfortable leaving the rabbits anywhere before, even with family but I trust Nikki completely with them. We'll definitely be bring the buns back when we next go on holiday! We've used Crumpets many times for our rabbits. It is a fantastic pet boarding place run by Nikki. She has lots of experience with small animals and she is also a Qualified Veterinary Nurse which came in handy as 2 of the rabbits were ill when we were away. Nikki always keeps us up-to-date about how they are doing which is always appreciated. I recently booked the grandchildren's rabbit 'Bubbles' into Crumpets and was enthralled with how much Bubbles seemed to enjoy her stay. I looked her up on Facebook whilst I was away and she was happily distracted munching on food ball trying to get to what I now know was dried pineapple - her new favourite treat. I found this very open and reassuring being able to check on her. Nikki is so knowledgeable and not only looked after Bubbles fantastically well but gave me so many good tips and advice. I was allowed into the pet area to settle Bubbles in upon arrival which was great. It is a delightful place. I could have stayed myself. Thank you Nikki you have a truly lovely small animal 'hotel'. I will bring a Bubbles back and I would recommend you without any hesitation. And finally Nikki you will be interested to know I have even purchased the de-moisturiser, making my own wonderful treats for Bubbles so thank you that and for everything. Discovering Crumpets was the best thing ever. Nikki gives the best care to our bunnies (we believe they are spoiled rotten when we are away) and we can go on holiday without any worries. We get regular updates and love being able to see pictures of them on the facebook page. Sometimes I think my rabbits don't want to come home! Teddy and Bronte had a holiday at Crumpets and were sad to leave. Nikki is so calm and the environment was perfect for the guinea pigs. We will always go back to Crumpets. Located in Finchley, North London. We are easily accessible a 5-10 minute drive off junc 2 of the M1. A 5 minute walk from Finchley Bus Station & West Finchley Tube. We have off road parking and are situated off Ballards Lane by Waitrose in North Finchley.